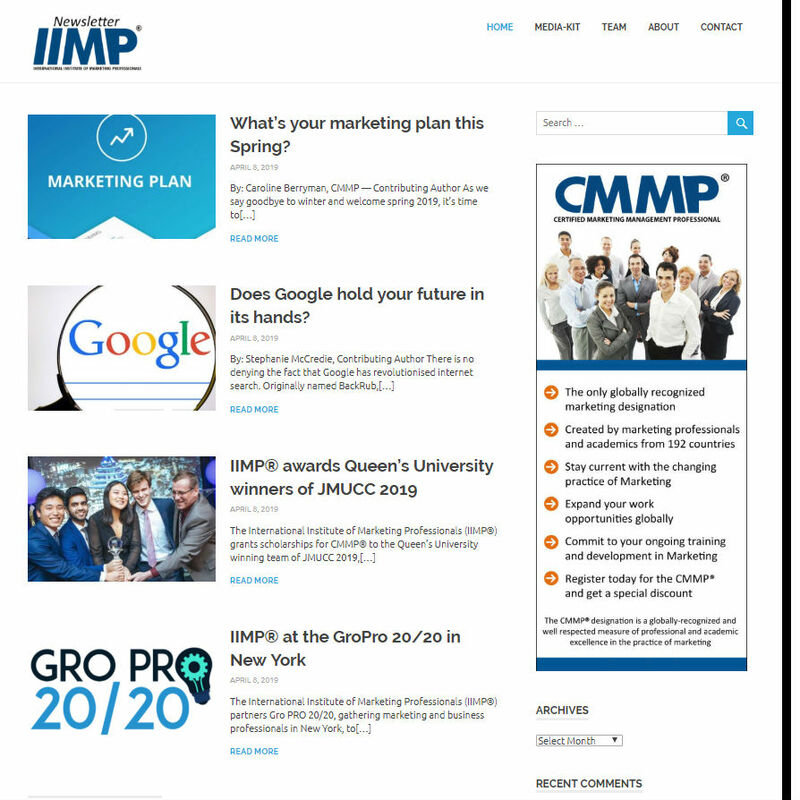 Toronto, Canada — August 05, 2015 — The International Institute of Marketing Professionals (IIMP®) endorses the master programme in International Marketing from the BPP University (United Kingdom), which grants its graduates with the CMMP® equivalency. This certification is part of the IIMP® Accredited Educational Institution agreement signed earlier this year. Through the accreditation of academic centers around the world, IIMP® sets the highest level of educational programs in the marketing field. Graduates from these educational programs will build their credentials and will qualify to earn CMMP® designation. 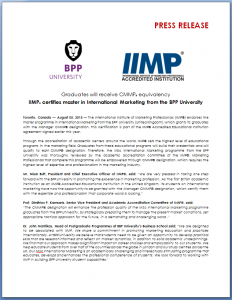 Therefore, the MSc International Marketing programme from the BPP University was thoroughly reviewed by the academic accreditation committee of the IIMP®. Marketing Professionals that complete this programme will be empowered through CMMP® designation, which requires the highest level of expertise and professionalism in the marketing industry. The BBP University was voted UK’s Best Higher Education Provider by Education Investor Magazine, in 2013. It’s the UK’s only university solely dedicated to business with programmes designed in partnership with employers and respected professionals in the fields of law, business, finance and health. Its tutors, most of who have real-world practitioner experience, ensure that students have the practical skills and academic knowledge needed for success as well as the competitive edge that makes them stand out in the competitive jobs market. International Institute of Marketing Professionals (IIMP®) is an independent not-for-profit professional organization, which develops and advocates international standards within the marketing field. IIMP® was formed in July 2009 and is a pioneer in its leadership and strategic approach towards developing the Internationally Accepted Marketing Standards™ based upon Generally Accepted Marketing Principles™ and Practices in the field of marketing. The development of Internationally Accepted Marketing Standards is led by the Internationally Accepted Marketing Standards™ (IAMST) Board which represents the G-20 countries; the IAMST Board members include senior academic leaders from reputable business schools and Chief Marketing Officers from major corporations across the G-20 countries. This diverse membership will undoubtedly bring a real synergy between the science and practice. The IAMST Board works with the aid and cooperation of teams from International Advisory Council for the Marketing Profession (IACMP), which has representation from 192 countries and Advisory Council of Marketing Practitioners (ACMP).